Railpictures.ca - Bill Thomson Photo: CN Mikados 3228 and 3282 doublehead a stone train from the Kirkfield Quarries, crossing Highway 35 in Lindsay on the Midland Subdivision. July 1958. [Editors' note: The CN Midland Sub was formerly the old Midland Railway, originally the Port Hope Lindsay and Beaverton Railway line from Lindsay to Beaverton.] | Railpictures.ca – Canadian Railway Photography – photographie ferroviaire Canadienne. 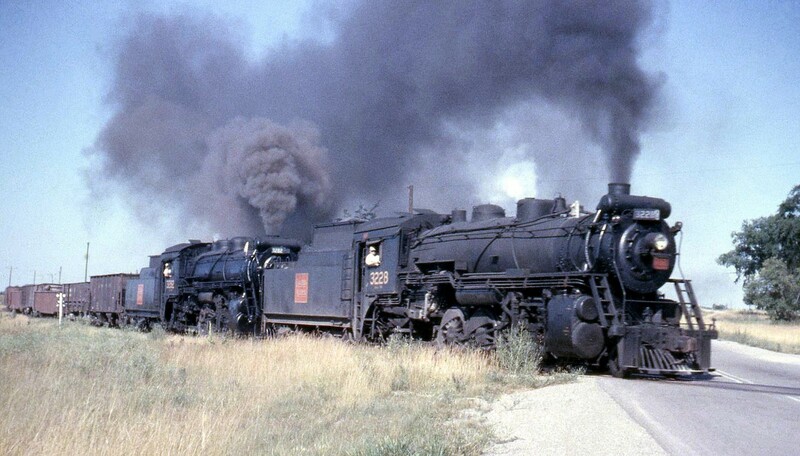 Caption: CN Mikados 3228 and 3282 doublehead a stone train from the Kirkfield Quarries, crossing Highway 35 in Lindsay on the Midland Subdivision. July 1958. Great photo and an interesting variety of cars for the stone. Switcher, use the ‘contact’ feature on Bill’s profile (also found on this page beside his name) to send a request. Do you have a contact email for Bill Thomson? Awesome! I sure missed out on the best days of railfanning. Looks like maybe a little extra smoke from the second engine for the photographer! Those hoppers and gons were filled from narrow gauge trains powered by steam dinky engines. When I was 7-8 years old in the mid 50s,I used to sit and watched them all day long as they stopped for coal and water,in 1960,the coal tower became obso and they threw it down with the water tank,sad. Looking at this image, it’s not hard to see why so many steam buffs packed it in when diesel came along. That is one impressive photo!